The QX50 always provided strong performance and a nicely finished interior, at least comparative to its peers in its earlier years, but its outward design never stirred my senses. 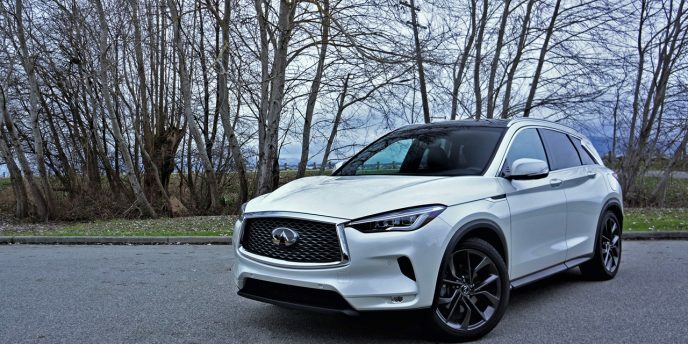 Not so for the completely redesigned 2019 QX50, however, as styling is now its number one asset, critical for making a good first impression. 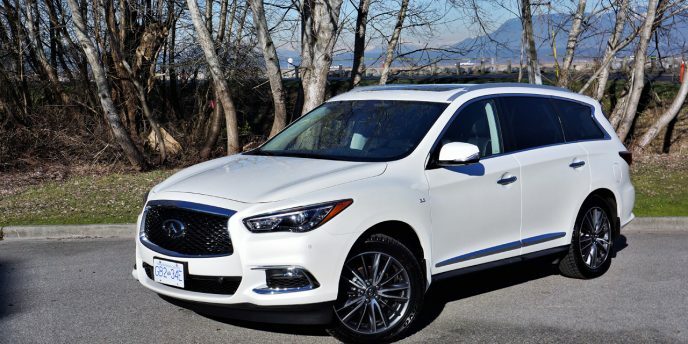 It seems like I’m not alone in my thinking, because year-over-year Canadian QX50 sales growth is already up 59 percent as of December 31, and it only arrived partway through 2018, while during the first two months of 2019 the new Infiniti found 113.7-percent more buyers than the previous generation lured in for January and February last year. Most should find this ground-up second-generation redesign pleasant to the eyes, thanks to a particularly eye-catching version of Infiniti’s double-arch grille situated under a long, elegantly shaped hood, and bookended by sharp, animal-like LED headlamps. It all hovers over a clean and sporty lower fascia that nicely ties the frontal design together for an overall design that should cause many more would-be buyers to pay attention. Likewise, there’s plenty of muscular sculpting to the side panels, these passing by a handsome chromed engine vent garnish on each upper front fender, plenty of additional chrome trim around the side windows, the rearmost of which curves with the brand’s distinctive reverse kink, while at back it’s equally attractive, particularly at the LED taillights, while, depending on trim, a variety of 19- to 20-inch alloys finish off the look. As visually appealing as the new QX50 is, Canadian SUV buyers need a generous cargo hold of practicality to keep their attention, not to mention premium levels of interior build quality, the latest electronic interfaces, and, of course, performance that matches or exceeds the best in this class. To that end, the new QX50 mostly delivers. As noted a moment ago, performance made the previous QX50 stand out, particularly its rear-wheel drive-biased handling, although the compact luxury crossover’s standard 3.7-litre V6, advanced seven-speed automatic, and Intelligent all-wheel drive were nothing to sneeze at either. And just how the new model’s exterior styling changes everything about the way the new QX50 looks, it is now powered by a comparatively tiny 2.0-litre turbocharged four-cylinder engine, uses a continuously variable transmission (CVT) to send torque to all four wheels, and rolls on a new front-wheel drive-based chassis, or in other words the new SUV is completely different than the outgoing model, down to its very core. The move from rear-wheel to front-wheel drive platform architectures is nothing new in this class due to interior packaging improvements with the latter, especially when it comes to rear seating and cargo capacity, but how does it impact the way the QX50 drives? On the positive, the new QX50 now provides a more comfortable ride. It floats smoothly over rough patches of pavement, bridge expansions, and other types of road irregularities, while it also benefits from a quieter cabin, partially due to using active engine mounts ahead of the seemingly better insulated firewall and an acoustic windshield plus acoustic side glass. The result is a more refined experience overall, which should bode well for meeting the wants and needs of most premium buyers, but then again those who previously chose the QX50 for its road-holding prowess may be a tad disappointed. Let’s face it. The old 2008–2017 QX50 (and prior EX35) was based on the old G35/G37 (Q50) sport sedan, and it felt like it, whereas the latest version rides on the Nissan Altima and Murano’s front-wheel drive-biased platform architecture, which while sporting a fully independent front strut and rear multi-link suspension design, plus standard Active Trace Control which autonomously increases brake pressure mid-corner to maintain a given lane, doesn’t provide enough help to turn this comfortable family hauler into a canyon carver. In a nutshell the new QX50 is a bit less planted to the road at highway speeds, especially when pushing hard through corners with broken pavement, and doesn’t achieve the same level of confidence on the open freeway either. This is the trade-off when choosing a front-biased layout, and while Infiniti has gone far to exorcise as many understeering demons from within, there was no way they could’ve make it feel as hooked up as the outgoing version. This said the new variable compression turbo engine is brilliant. It provides more immediate power from its small displacement than the majority of rivals’ base engines, despite measuring an identical 2.0 litres. How much more? Try 268 horsepower and 280 lb-ft of torque delivered to all four wheels, resulting in quite a bit more output than its entry-level compact luxury SUV market segment’s peers. The top seller is now Mercedes-Benz’ GLC, which only provides 241 horsepower and 273 lb-ft of torque, while the second-place Audi Q5 is good for just 248 hp and 273 lb-ft (which are identical numbers to the Porsche Macan that uses the same engine). Likewise, the third-place BMW X3 is capable of 248 hp and 258 lb-ft of torque, while the QX50’s mill is considerably more potent than Lexus’ latest base NX that can only achieve 238 hp and 258 lb-ft, while Cadillac’s fresh new XT4 is rated at a comparatively wimpy 237 hp and 258 lb-ft. All said the new QX50 isn’t the quickest in the segment, with the recently revitalized Acura RDX capable of 272 hp and 280 lb-ft of torque, and Alfa Romeo’s Stelvio leading the segment’s base engine output with 280 hp and 306 lb-ft of torque (both are more fun to drive, too). Still, the Infiniti CUV’s output is more than respectable. In fact, WardsAuto just included the VC-Turbo as on of this year’s 10 Best Engines. The new engine design took Infiniti’s engineering department a full four years to develop, and features special connecting rods between its pistons and crankshaft that vary the compression of the fuel and air mixture, with less increasing power output when called upon, and more improving fuel-efficiency under lighter loads such as when cruising and coasting. I know all this tech talk can be a bit dry, but I’m more concerned that I lost your interest earlier in this review when mentioning that Infiniti swapped out its seven-speed auto for a CVT, being that CVT is usual a three-letter acronym that correctly describes an economical and smooth yet dull and boring technology. Fortunately, however, along with tackling the problem of ever-increasing carbon tax-induced gasoline prices the new transmission is actually a strong performer. It utilizes a completely new shift-by-wire design that features manual shift mode, steering wheel paddles, Downshift Rev Matching (that blips the throttle to match a given gear ratio with engine revs), plus dual transmission fluid coolers, resulting in a fairly conventional feeling transmission. The CVT responds better than expected when flicking through its paddles too, and is plenty of fun to drive with Sport mode engaged. The VC-Turbo’s power comes on quickly, but this is where the faux stepped-gear CVT doesn’t quite measure up to its multi-speed automatic rivals, as it allows engine revs to remain too high for too long, thus interfering with performance, adding to noise, vibration and harshness levels, and ironically impinging on fuel-efficiency. If driven like most of us do when behind the wheel of a compact crossover SUV, however, it’s a wonderfully smooth and refined transmission that combines a high level of day-in and day-out performance with claimed fuel economy that’s 30 percent better than the outgoing model, now rated at 10.0 L/100km city, 7.8 highway and 9.0 combined, compared to 13.7 city, 9.8 highway and 11.9 combined. If you were to ask me for one key complaint, it’s Infiniti’s Eco Pedal that pushes rearward on the gas pedal (and therefore your right foot) in order to try and influence you not to press too hard. I find it terribly annoying, and therefore never turn Eco mode on when using an Infiniti vehicle, so therefore I end up losing out on all the other benefits that the brand’s Eco mode provides, like the best possible fuel economy just noted. I’m guessing that I’m not alone, so Infiniti would do well to allow its owners to turn off the Eco Pedal when Eco mode is engaged. Those who don’t mind its interference can choose that Eco mode, as well as all of the QX50’s other drive settings from a “D-MODE” inscribed, metal-adorned rocker switch atop the lower console, just behind a totally new electronic shift lever design. 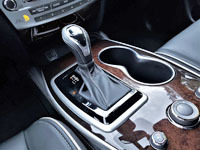 Smaller and shorter, although well crafted from satin-silver aluminum and contrast-stitched leather, the new shifter provides a more normal gear selection process than some others in this class, particularly Acura and Lincoln that are obsessed with buttons. The only button Infiniti uses is a small black one with a “P” label for selecting park. Just above the shift lever on a separate lower console section is an elegantly stylish knurled metal infotainment controller surrounded by high-quality buttons, while a volume knob on the centre stack provides nearly the same level of luxury detailing. There’s no shortage of aluminized metal trim throughout the rest of the cabin either, albeit tastefully applied so it’s not overbearing, with personal favourites being the edges of each power window switch and the gorgeous geometrically drilled Bose speaker grilles. This brings up the quality and fitment of all buttons, knobs and switches, which are well damped, tightly fitted, and made from dense composites when not covered in metal, allowing the QX50 to meet the level of refinement delivered by the majority of its rivals, and exceed some. Additional niceties include beautiful open-pore natural maple hardwood inlays (a Sensory trim exclusive) and lush black ultrasuede (also exclusive to the Sensory), both used on the instrument panel, centre stack, lower console, front seat bolsters and door uppers front to back, while the two front and second set of roof pillars, plus the roofliner itself, were covered in the charcoal ultrasuede alone. Lastly, classy contrast-stitched leather was also generously applied throughout the interior, the QX50 Sensory’s cabin truly a cut above. To be clear, the QX50 provides high-grade premium surfaces, along with nice metal and wood accents above the waist, even coating its glove box lid with soft-touch paint, but like many in this class Infiniti stops pampering at this mid-point, instead applying hard plastics to the lower dash, sides of the centre console, and lower door panels. It’s a cost cutting measure for sure, but some will say the harder composite provides durability, weight savings and even recyclability, yet this is the luxury class, so therefore I think Infiniti should be doing more to measure up to leaders like the aforementioned BMW X3, which applies soft-touch to more surfaces. Still, the QX50 interior is much nicer than some other peers, and should impress most who step inside. Of course, it’s best in near top-line $56,490 Sensory trim, or when equipped with the more bespoke $57,990 Autograph model’s upgrades. These two trims are mostly the same when it comes to features, but differ in the application of some interior colours and materials. For instance, both use luxury-grade semi-aniline leather upholstery, those sumptuous ultrasuede accents just noted, and real hardwood inlays, but the Sensory’s colour theme is charcoal black and the Autograph is a two-tone blue and white motif, while its leather seats get a rich diamond-quilted pattern (in white) and its side bolsters are highlighted with blue piping. It’s a look you’ll adore, and therefore need to acquire, or not, and fortunately Infiniti makes it optional so it’s only a dealmaker, not a deal-breaker. 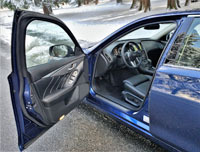 Other features found with both trims include two-way front passenger powered lumbar support, three-way cooled front seats, advanced climate control (with auto-recirculation, a Plasmacluster air purifier and a Grape Polyphenol Filter), extended interior ambient lighting, rear side window sunshades, a gesture-activated hands-free liftgate, and metal cargo area trim, while exterior upgrades include a sweet looking set of 20-inch dark tinted alloys on 255/45 all-season run-flat tires, plus really nice looking cube design LED high/low beam headlamps with adaptive cornering capability. The two top-line models utilize many of the features found in lesser trims too, such as the $52,990 ProActive model’s auto high beams, dynamic cruise control (with full speed range and hold), distance control assist, lane departure warning, lane departure prevention, blindspot intervention, rear cross-traffic warning, backup collision intervention, steering assist, the ProPilot Assist semi-autonomous self-driving system (which gets very close to full autonomy while traveling on the highway), Infiniti’s exclusive steer-by-wire Direct Adaptive Steering system (a first for an Infiniti SUV) that’s very reactive to steering input (other trims use vehicle-speed-sensitive power steering), a head-up display unit, and a superb sounding 16-speaker Bose Premium Series audio system. Additionally, a bevy of items get pulled up from $48,990 Essential trim, such as rain-sensing windshield wipers, front/rear parking sonar, reverse-tilt side mirrors, Infiniti’s excellent 360-degree Around View parking camera with moving object detection, very accurate navigation routing with a superbly detailed mapping system, three-zone auto climate control with controls for the rear passengers (upgraded from the two-zone automatic HVAC system found in lesser trims), a power tilt and telescoping steering column, and memory for that steering wheel column, plus the front seats and side mirrors. Lastly, $44,490 base Luxe trim provides LED fog lights, LED turn signal repeaters integrated within the side mirrors, LED tail lamps (the Luxe is also standard with LED low/high beam headlamps), chromed outer door handles, chromed tailpipe finishers, a remote engine starter, proximity keyless entry, pushbutton start/stop, the previously noted drive mode selector featuring standard, eco, sport, and personal settings, a panoramic glass sunroof with a powered sunshade, a power liftgate (without hands-free), predictive forward collision warning, forward emergency braking with pedestrian detection, blindspot warning, plus plenty more. Of note, all 2019 QX50 pricing for trims, packages, and standalone options were sourced from CarCostCanada, which also provides money-saving manufacturer rebate info and otherwise difficult to find dealer invoice pricing that could help save you thousands. For many, the new QX50’s advanced electronic interfaces will be most important, and I must admit they certainly help modernize the look of the interior and the SUV’s overall functionality. First and foremost is the new InTouch twin-display infotainment setup on the centre stack, boasting a bright, clear and colourful high-resolution 8.0-inch monitor on the upper position, and a 7.0-inch touchscreen underneath, plus InTouch safety, security and convenience services, etcetera. I found this system mostly easy to use, with the top display, which provides navigation info, various views from the backup/surround camera system and more, controlled by the beautifully made rotating dial on the lower console mentioned earlier, and the lower one by tablet-like tap, swipe and pinch finger gestures. As for the primary gauge package ahead of the driver, I was somewhat dismayed that Infiniti didn’t take this opportunity to introduce a fully digital cluster, as this is now expected in top-tier trims (VW is even doing so with its latest Tiguan), but the mostly analogue dials the automaker provided worked well enough, and the large colour multi-information display certainly wasn’t short on functionality, all of which were easily controlled by a nicely organized set of steering wheel switches. Looking upward, a new overhead console includes the usual reading lights, buttons for the sunroof, plus a wholly redesigned sunglasses holder that, surprise, surprise comes without an intrusive nosepiece so that all of my sunglasses fit inside without issue. Just why previous versions were made with a nosepiece that was too big to hold regular glasses in place is beyond my scope of understanding, but fortunately Infiniti has remedied this problem once and for all. 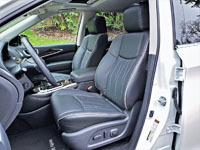 The sunglasses holder isn’t the only improvement made to passenger and cargo roominess, with rear passengers now benefiting from significantly more legroom and headspace. Infiniti actually claims that the QX50’s rear seating area is larger than both Audi’s Q5 and BMW’s X3, while rear passengers can now slide their seats forward and rearward in order to increase legroom or alternatively add to available cargo space. Unsurprisingly the rear outboard positions were very comfortable, while I had about eight inches of space for my knees when the driver’s seat was preset for my five-foot-eight long-legged, short-torso, medium-build body. Additionally, there was plenty of room for my winter boots, albeit not much for tucking them under the driver’s seat. Speaking of narrow spaces, the compact QX50’s compromised width was made evident by the lack of inches to the door panel, but the outer armrest was comfortable and my shoulder never felt hemmed in. Adults in back might find the flip-down centre armrest on the low side, but it’s perfect for children, and it includes a slot for storing your smartphone plus a pair of cupholders. The previously noted rear climate controls are about as minimalist as such items go, only combining a digital watch-sized black and white LCD display with single red and blue buttons for adjusting the temperature. Infiniti adds a USB device charger and 12-volt socket too, but oddly rear seat warmers aren’t even on the QX50 menu. On the positive, cargo capacity has generously increased by 368 litres (13.0 cubic feet) to 895 (31.6 cu ft) behind the standard 60/40-split rear seats, but remember you can slide them forward for another 153 litres (5.5 cu ft), increasing total capacity behind the rear seatbacks to 1,048 litres (37.0 cu ft). A helpful lever on each sidewall folds the respective rear seat flat, opening up a maximum of 1,822 litres (64.3 cu ft) when both sides are lowered. The weakness to the QX50’s 60/40-configured seatback design becomes apparent when wanting to stow longer items such as skis down the middle when family or friends are coming along for the ride, because there’s no centre pass-through or best-possible 40/20/40-division for optimizing passengers and cargo flexibility. If a higher level of real-life practicality matters to you, the Europeans tend to do a better job. As is now expected in this class, the standard powered liftgate is programmable for height, a very important feature if your parking garage is lower than average, and even more so if pipes hang down further (been there done that). This said I kept bumping my forehead into the open hatch until finding time to reprogram it, not a fault of Infiniti, but something new owners may want to watch out for. All should be happy with the cargo area’s finishings, mind you, thanks to attractive aluminum sill guards and carpeting most everywhere, while the cargo floor can be removed to store smaller items in two shallow stowage bins, the most forward one also housing the Bose amplifier and subwoofer. After a week with Infiniti’s new QX50 I’d say the pros more than outweigh the cons, but you’ll need to decide this for yourself when testing. Its styling should be universally positive, and most will probably praise its upgraded interior and much improved electronics too, while its host of advanced driver assistance systems will no doubt be lauded as well. I found it roomy and comfortable, plus its driving position is excellent, important for extracting all of its straight-line performance and maximizing support when pushing it through the corners, but this new QX50 is built more for comfort than speed when compared to the outgoing one, which will probably be just fine for the majority of its buyers. I won’t go out on a limb to say it’s best in class, and honestly would truly be hard pressed to claim this about any rivals either, but you really should spend some quality time with this new model before purchasing anything else. In other words, the new QX50 is worthy of your close attention, because it just might fit your wants and needs ideally, and save you a few thousand in the process. 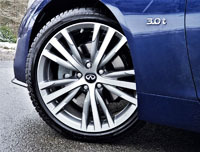 Infiniti gave its only relevant sedan a mid-cycle refresh last year, updating the Q50’s grille, front fascia, headlights, taillights, rear bumper and more, so 2019 doesn’t see any visual changes other than a new Canada-exclusive standard “I-LINE” cosmetic treatment specifically for the now renamed I-Line Red Sport 400 model. Just like eyeliner, the I-Line upgrade, which was actually derived from “Inspired Line,” blackens the grille surround in the same fashion as last year’s glossy black fog lamp bezels and diffuser-style rear bumper cap, while the rear deck lid spoiler gets upgraded to high-gloss carbon fibre and wheel wells are filled with a special “custom imported” glossy black finish set of 19-inch alloys. I-Line trim further helps to visually differentiate Infiniti’s sportiest 400-horsepower Q50 from lesser trims in the lineup, a smart move considering the $7,700 leap from the already quick 300 horsepower Q50 3.0T Sport AWD. Both 300 and 400 horsepower versions of the Q50 source their power from the same turbocharged 3.0-litre V6 engine in different states of tune, while the other big change for 2019 is the elimination of the Mercedes-Benz-sourced 2.0-litre four-cylinder that continues to make 208 horsepower in other markets where it’s still offered, like the U.S.
All remaining trims utilize Infiniti’s seven-speed automatic transmission with manual shift mode and downshift rev matching, the latter a rarity in this class, while Infiniti’s “Intelligent” all-wheel drive system comes standard as well. Keeping up with the Jones’s, 2019’s biggest Q50 addition is the inclusion of Predictive Forward Collision Warning (PFCW) and Forward Emergency Braking (FEB) as standard equipment, which means these critical accident avoidance systems are now part of the Luxe model, Luxe being the base trim level in the Q50’s recently revised grade structure. Without going into detail about each trim, the Q50 3.0T Luxe AWD starts at $44,995 plus freight and fees, and the model in our garage this week, the Q50 3.0T Signature Edition starts just a hair higher at $46,495, whereas the aforementioned Q50 3.0T Sport AWD enters the picture at $48,495, and newly revised I-Line Red Sport 400 starts at $56,195. With all of that out of the way, there’s nothing remotely base about the twin-turbo V6 behind the Q50’s trademark grille, thanks to the 300 horsepower noted a moment ago, and the direct-injected mill’s equally impressive 295 lb-ft of torque (well, almost equally impressive). I’ve waxed poetic about this engine before, and I’ll probably do so again in my upcoming review, not to mention go on at length about the seven-speed gearbox and “Intelligent” AWD system, that’s actually pretty smart. Some upgrades specific to our tester’s Signature Edition trim that you might find interesting include the exact same performance-oriented exterior styling details as the Sport, particularly the sharper gloss black lip spoiler and deeper black fog lamp bezels up front, and a less aggressive version of the black and body-colour diffuser-infused rear bumper mentioned earlier, while both models make use of the same more conventional silver-painted 19-inch alloy wheels on 245/40 all-season run-flat performance tires, an upgrade over the base Luxe model’s 18-inch rims on 225/50 all-season run-flat performance rubber. Lastly, both trims get silver “S” badges on the front fenders, but strangely the Signature Edition gets a unique rear deck spoiler just above its own “Signature Edition” decklid badge, whereas the Sport makes do with no rear spoiler at all, although it gets a silver “S” badge next to its Q50 nomenclature. Signature Edition and Sport trims also feature the same Sport Type seats with driver-side powered lumbar support and powered torso bolsters, plus manual thigh extensions for both front occupants, while both models’ surrounding decorative inlays are finished in genuine Kacchu aluminum. Pretty well every other feature is shared with the Q50 Luxe, which is why there’s only $1,500 separating the two trims, so along with all of the items above the Q50 Signature Edition includes standard auto on/off LED headlights with LED daytime running lights, LED fog lamps and front turn signals, LED brake lights, aluminum “INFINITI” branded kick plates, proximity-sensing keyless entry, pushbutton ignition, Infiniti’s “InTuition” for storing climate, audio and driving preferences within each “Intelligent Key”, welcome lights on the front exterior door handles, rain-sensing wipers, an auto-dimming rearview mirror, a garage door opener, micro-filtered dual-zone auto climate control, Infiniti InTouch infotainment with 8.0-inch upper and 7.0-inch lower displays, a rearview camera, Bluetooth phone and streaming audio, six-speaker AM/FM/CD/MP3/satellite audio with HD playback, RDS and speed-sensitive volume, two USB ports, a heatable steering wheel, heated front seats, powered front seats, a powered moonroof, and more. Of note, a number of features that were previously optional are now standard with the move up to the base V6 powerplant, including remote engine start, Infiniti InTouch navigation with lane guidance and 3D building graphics, the Infiniti InTouch Services suite of digital alerts and remote services, voice recognition for audio, SMS text and vehicle info, power-adjustable lumbar support for the driver, and 60/40 split-folding rear seatbacks with a centre pass-through. At the other end of the trim spectrum, the only real changes to previously noted Sport trim are actually performance oriented, such as steering wheel-mounted paddle shifters, a unique sport-tuned dynamic digital suspension, and identical sport brakes to the Red Sport 400, which boast four-piston front calipers and two-piston rear calipers, while the two sportiest trims also get exclusive front seat-mounted side-impact supplemental airbags. Speaking of features not available with this Signature Edition, only Sport trim gets the option of electronic power steering, while Infiniti’s exclusive drive-by-wire Direct Adaptive Steering (DAS) system is available on all trims except for the Signature Edition, as is the auto-leveling adaptive front lighting system (AFS) with high beam assist, a power-adjustable steering column with memory, an Around View Monitor (AVM) with Moving Object Detection (MOD), premium 16-speaker Bose Performance audio with Centerpoint technology, front and rear parking sensors, Intelligent Cruise Control with full speed range (ICC), Distance Control Assist (DCA), Blind Spot Warning (BSW), Blind Spot Intervention (BSI), Lane Departure Warning (LDW), Lane Departure Prevention (LDP) with Active Lane Control, and Backup Collision Intervention (BCI) with Cross Traffic Alert (CTA). Features not available with the Signature Edition, optional with the Sport and standard with the Red Sport 400 include auto-dimming side mirrors with reverse link and memory, plus Infiniti’s Advanced Climate Control System with auto-recirculation, Plasmacluster air purifier and Grape Polyphenol Filter. All of this seems to place the Q50 Signature Edition in a unique value position, offering plenty of Sport trim features yet limiting its choice of options to colours, of which include the same five offered in Sport trim, and interior themes, which just like the Sport can be had in Graphite (black) and Stone (grey) interior motifs. 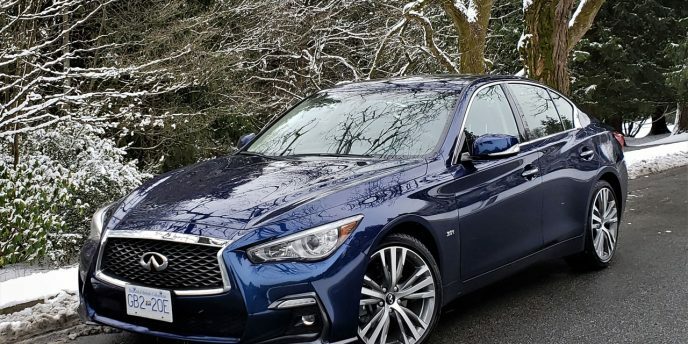 By the way, the base model can be had with a Wheat (tan) interior, while dark-stained gloss maple hardwood provides a more traditional luxury ambiance, plus you’ll lose the option of Mocha Almond (brown metallic) paint when moving up into the sportier Q50 trims, but you gain Iridium Blue in both Signature Edition and Sport trims, whereas Red Sport 400 buyers get exclusive Dynamic Sunstone Red. Infiniti showed up at last month’s Salon International de l’Auto de Montréal with a new Canada-exclusive “I-LINE” trim upgrade for the sportiest versions of its popular Q50 luxury sedan and Q60 sports coupe. Specifically, Infiniti is in the process of replacing the Q50 and Q60 Red Sport 400 models available last year and earlier this year with the new Q50 I-Line Red Sport 400 and Q60 I-Line Red Sport 400, which means that buyers spending the $7,700 needed to move up from the 300 horsepower Q50 3.0T Sport AWD, or $9,500 to do the same from the Q60 3.0T Sport AWD, to get into one of the 400 horsepower I-Line Red Sport 400 models, now get more visual bang for their buck. I-Line, which Infiniti says was derived from “Inspired Line,” blackens both models’ grille surrounds so that they more closely tie in with the glossy black fog lamp bezels and diffuser-style rear bumpers found on the outgoing Red Sport 400 cars, while the rear deck lid spoiler has been upgraded to high-gloss carbon fibre, and wheel wells are now filled with a special “custom imported” glossy black finish set of 19-inch alloys. These changes make both I-Line Red Sport 400 models appear as if they have larger more imposing grilles, while the black alloys go further toward creating a more powerful, menacing look. The outgoing Red Sport 400 cars already featured glossy black rear deck lid spoilers, but replacing these composite lip spoilers with more sophisticated carbon fibre ones helps to elevate the two cars into BMW M and Mercedes-Benz AMG territory, befitting of performance models making 400 horsepower apiece. Behind all that thrust is a twin-turbocharged, direct-injection 3.0-litre V6 that also produces 350 lb-ft of maximum torque from just 1,600 rpm, which is connected to Infiniti’s “Intelligent” all-wheel drivetrain via an advanced in-house produced seven-speed automatic transmission featuring manual shift mode and downshift rev matching, the latter function rare in this segment. Pricing for the 2019 Q50 I-Line Red Sport 400 sport sedan starts at $56,195, while the 2019 Q60 I-Line Red Sport 400 sports coupe can be had for $65,295. Both models, which are available across Canada this month, can be fully configured at CarCostCanada, with full pricing of trims, packages and individual options available, plus otherwise hard to find manufacturer rebate info and dealer invoice pricing that could save you thousands. 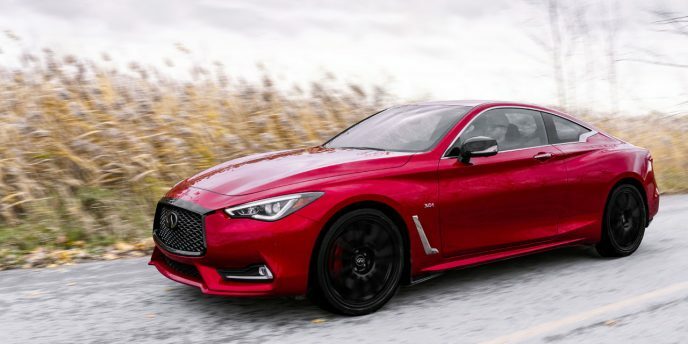 Also, take note that many Canadian Infiniti retailers will still have outgoing 2019 Q50 and Q60 Red Sport 400 models available, which they’ll probably be more than willing to sharpen their pencils on in order to make a deal. Infiniti wasn’t the fastest growing luxury brand last year, but then again it gained market share while plenty of others lost ground. What’s more, its best-selling QX60 mid-size crossover SUV increased sales by more than 17 percent for the strongest result in its mid-size class, when the Acura MDX, Audi Q7, BMW X5, Mercedes GLE and GLS, plus most others saw their numbers go down. That’s an impressive result for an SUV that’s merely a more luxurious Nissan Pathfinder. Ouch, I know, that might sound harsh to some, but really it’s no bad thing. Look around and you’ll see plenty of premium brands that rely on their mainstream volume counterparts for rolling stock and more, and to be fair Infiniti has done a good job visually separating the two when it comes to exterior styling. Inside, however, it’s easy to see where the QX60 pulls more than just inspiration. The gauge cluster layout is near identical, as is the rest of the instrument panel and entire centre stack, not to mention the door panels and the three rows of seats front to back. Still, where the Pathfinder feels a bit less refined than its closest rivals, with way too much hard plastic, you’ll be hard pressed to find anything discomforting in the QX60. Our tester is outfitted in the new $4,200 Sensory package, which ups the luxury quotient further by adding maple hardwood inlays to the dash, console and doors, plus special hourglass quilting to the leather upholstery, while the already heated front seats are now ventilated and the second-row outboard positions heated. Additionally, the third row gets a powered return to make loading cargo easier, while accessing the rear luggage area is more convenient thanks to a motion activated liftgate. Back inside, all occupants will enjoy a 15-speaker surround-sound Bose audio upgrade featuring digital 5.1-channel decoding, while appreciate the Advanced Climate Control System (ACCS) featuring auto-recirculation, a plasmacluster air purifier and grape polyphenol filter, while second- and third-row passengers benefit from the open airiness of a powered panoramic moonroof overhead, complete with powered sunshades. Lastly, 15-spoke 20-inch alloys on 235/55 all-seasons improve the QX60’s look and driving characteristics. But wait, there’s more. In order to get the Sensory package you first need to upgrade to the new $5,000 Essential and $4,800 ProActive packages, the first including remote engine start, entry/exit assist for driver’s seat and steering wheel, rain-sensing wipers, reverse tilt-down side mirrors, two-way power lumbar support for the driver’s seat, two-way driver’s memory with an Enhanced Intelligent Key, a 13-speaker Bose audio system, leather upholstery, Infiniti InTouch infotainment with navigation, lane guidance, and 3D building graphics, voice recognition, an Around View parking monitor with Moving Object Detection, front and rear parking sensors, SiriusXM Traffic, and more. The ProActive package adds auto-dimming side mirrors, high beam assist, full-speed range adaptive cruise control, distance control assist, active trace control, Lane Departure Warning (LDW) and Lane Departure Prevention (LDP), Blind Spot Intervention, backup collision intervention, front pre-crash seatbelts, and Infiniti’s exclusive Eco Pedal. All of this kit gets added to a QX60 that’s already well equipped in renamed base Pure form with features like auto on/off LED headlights, LED daytime running lights, LED fog lights, LED taillights, roof rails, power-folding side mirrors with integrated turn signals, proximity-sensing keyless access, pushbutton ignition, a heatable leather-wrapped steering wheel, a powered tilt and telescopic steering column, electroluminescent gauges, an eight-way power driver’s seat, a six-way power front passenger’s seat, a auto-dimming mirror, a HomeLink universal garage door opener, a powered moonroof, micro-filtered tri-zone automatic climate control, an 8.0-inch centre touchscreen with a backup camera, SMS/email display, satellite radio, three USB charging ports, a powered rear liftgate, Predictive Forward Collision Warning (PFCW), Forward Emergency Braking with Pedestrian Detection (PFEB), Blind Spot Warning (BSW), and more. The QX60 also comes standard with all-wheel drive fed by a highly efficient continuously variable transmission with default, Sport, Eco and Snow driving modes, the second mode mentioned making the most of the standard direct-injection infused 3.5-litre V6 that makes a strong 295 horsepower and 270 lb-ft of torque while still claiming a very reasonable 12.5 L/100km in the city, 9.0 on the highway and 10.9 combined. 2019 QX60 pricing starts at just $48,695, and take note all pricing for the QX60 and its competitors can be found at CarCostCanada, where you’ll also benefit from rebate information and dealer invoice pricing that could save you thousands. Considering how important the compact luxury SUV segment is within the entire auto sector, what took you so long Infiniti? Of course, unlike Cadillac that’s just starting to offer its XT4 compact SUV now (Alfa Romeo even beat them to the mark with their Stelvio), the QX50 has long been part of Infiniti’s lineup, its previous EX35 nameplate reaching all the way back to 2007 when it arrived as a 2008 model. It was rebadged QX50 in 2013 as part of Infiniti’s Q (car) and QX (SUV) renaming scheme, and received an updated grille and lower fascia for 2015, but this means the FM platform-based crossover soldiered on mostly unchanged for 11 years before the new second-generation 2019 QX50 started rolling out of its Aguascalientes, Mexico production plant a little more than a year ago. The new QX50 couldn’t be any more different than the outgoing model, from the previous SUV’s rear-wheel drive biased architecture to a totally new front-wheel drive based layout, although take note that all-wheel drive is standard here in Canada. Manufacturers have been moving away from rear-drive platforms due to interior packaging restrictions, something Audi and Acura have known for more than a decade and likely one reason why their compact SUVs continually outsell all opposition. No doubt Infiniti would love to have similar success, but last year the QX50 was just 12th out of 14 compact luxury SUV entrants, and the latter two were totally new models only available for part of the year. So far 2018 is looking up thanks to this redesign, with sales having surpassed all of 2017 after just nine months, while it’s also passed right on by the Lincoln MKC, Jaguar F-Pace and Land Rover Discovery Sport, almost catching up to the Buick Envision as it’s climbed to ninth overall. It’s entirely possible we’ll see the QX50 in eighth place before the year is out, but now that it’s been in our garage for the better part of a week we think it should be finding even more success than that. First of all the 2019 QX50 is one great looking SUV. Its front end is especially attractive, positioning Infiniti’s always stylish double-arch grille below a long, elegantly sculpted hood, and flanked by a stunning set of LED headlamps over a clean, sporty lower fascia. Organically shaped panels flow rearward down each side, passing by a nicely detailed chrome engine vent garnish on the upper front fenders, a metal brightwork adorned greenhouse finalizing with Infiniti’s trademark kinked rear quarter windows, and around the back where a particularly appealing rear end design features nicely shaped LED taillights, while a variety of 19- to 20-inch alloy wheels round out the design depending on trim. The QX50 is available in five trims for 2019, including base Luxe that starts at $44,490, Essential for $48,990, ProActive for $52,990, as-tested Sensory for $56,490, and finally top-line Autograph trim for $57,990. 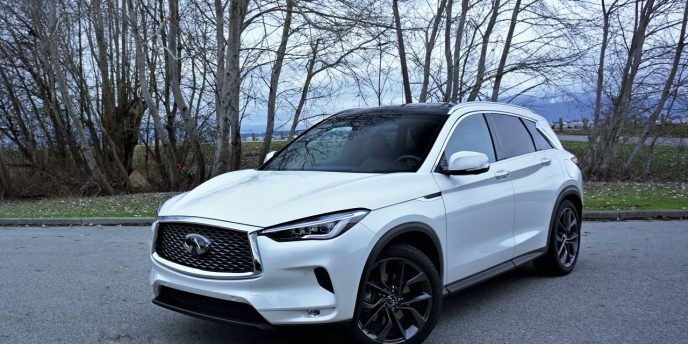 For full pricing of 2019 QX50 trims, packages, and standalone options, plus money saving manufacturer rebate info and otherwise hard to get dealer invoice pricing that could help you save even more, make sure to visit CarCostCanada. Along with AWD, even base Luxe trim comes well equipped with 19-inch alloys on 235/55 all-season run-flat tires, LED high/low beam headlights, LED signature daytime running lights, LED fog lamps, LED integrated turn signals on outside mirror housings, LED taillights, chrome-accented exterior door handles, dual chrome exhaust tips, remote engine start, proximity-sensing keyless access with pushbutton ignition, drive mode selector with standard, eco, sport, and personal settings, Infiniti’s InTouch dual display infotainment system featuring an 8.0-inch monitor on top and a 7.0-inch touchscreen below that, InTouch safety, security and convenience services, dual-zone automatic climate control, a powered panoramic glass sunroof including a powered sunshade, a powered liftgate, predictive forward collision warning, forward emergency braking with pedestrian detection, blindspot warning, and more. Moving up to Essential trim adds a number of items you might want on your must-have list such as rain-sensing wipers, front and rear parking sensors, reverse tilting side mirrors, Infiniti’s 360-surround Around View parking monitor with moving object detection, navigation with detailed mapping, tri-zone automatic climate control with rear controls, leather upholstery, a powered tilt and telescopic steering column, plus memory for that steering wheel as well as for the front seats and side mirrors. ProActive trim is for those who consider advanced safety and convenience essential, as it includes automatic high beams, adaptive cruise control with full speed range and hold, distance control assist, lane departure warning and prevention, blindspot intervention, rear cross-traffic alert, backup collision intervention, steering assist, ProPilot Assist semi-autonomous self driving, Infiniti’s exclusive steer-by-wire Direct Adaptive Steering system (a first for an Infiniti SUV), a head-up display, and a 16-speaker Bose Premium Series audio upgrade. As the name implies Sensory is more about creature comforts, and while including everything already mentioned also adds 20-inch dark tinted alloys on 255/45 all-season run-flat tires, unique cube design LED high/low beam headlamps with adaptive cornering capability, extended interior ambient lighting, advanced climate control, natural open-pore maple wood inlays, ultrasuede A- and B-pillars plus an ultrasuede headliner, beautiful black ultrasuede upper instrument panel trim, door uppers, and centre console lid accents for Graphite black-trimmed interiors, while Wheat beige interiors receive leatherette accents, premium-grade semi-aniline leather upholstery, ventilated front seats, two-way front passenger powered lumbar support, rear side window sunshades, a motion activated liftgate, and metallic cargo area finishers. Autograph trim moves up the luxury while offering something even more individually bespoke looking, thanks to special blue ultrasuede accents replacing the black found in the Sensory model, plus white used for much of the instrument panel, centre console sides, door inserts and seats, the centre inserts of the latter featuring diamond-quilted semi-aniline leather, plus blue piping between the white leather and blue ultrasuede. On a more practical note, the new QX50 is quieter than the outgoing model thanks to active engine mounts plus acoustic windshield and side window glass, while it’s also much roomier, especially when for rear passengers that now enjoy considerably more leg and headroom. 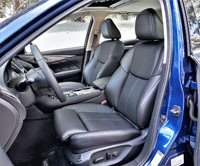 In fact, Infiniti claims its rear seat space is greater than the best-selling Audi Q5 and BMW’s X3, while those back seats now slide fore and aft for more cargo space or better legroom respectively, the former growing by a substantive 368 litres to 895 behind the 60/40 split-folding rear seats, even when they’re pushed all the way backward, while sliding the rear bench as far forward as possible adds another 153 litres of gear toting capacity for a total volume of 1,048 litres when both rows are occupied. Lay the second-row seatbacks flat and cargo space expands to 1,822 litres. As for performance, previously noted standard features like the 19- and 20-inch wheels, Intelligent AWD, and the various driving modes, as well as standard vehicle-speed-sensitive power steering or available Direct Adaptive Steering, combine with a fully independent front strut and rear multi-link suspension setup, standard Active Trace Control that autonomously adds brake pressure mid-corner to help maintain a chosen lane, plus one of the more advanced four-cylinder engine designs available today. In fact, WardsAuto just added the QX50’s new VC-Turbo to its 2019 model year 10 Best Engines list, which is nothing new for Infiniti that’s long had one of its V6 mills honoured likewise, the latest being the Q50/Q60’s 3.0-litre twin-turbo VR V6, with previous generation 3.7- and 3.5-litre engines awarded as well. The 2.0-litre four-cylinder VC-Turbo is the world’s first production variable compression ratio engine, a technology that took Infiniti’s engineering team four years to develop. It features special connecting rods between its pistons and crankshaft that vary the compression of the fuel and air mixture, less for increasing power output when needed and more during lower loads like cruising and coasting for improving fuel efficiency. The result equals 268 horsepower and 280 lb-ft of torque while fuel economy is closer to a 2.0-litre diesel four than anything gasoline-powered with similar performance. Combined with a new shift-by-wire continuously variable transmission (CVT) featuring manual shift mode, steering wheel paddles, Downshift Rev Matching, and dual transmission fluid coolers, Infiniti claims the new QX50 is 30-percent more efficient than the outgoing model, which was five-cycle rated at 13.7 L/100km city, 9.8 highway and 11.9 combined compared to 10.0 city, 7.8 highway and 9.0 combined for the new powertrain. Even with today’s fuel prices dropping along with the price of oil, every little bit counts when also factoring in our fragile economy that’s following that downward trajectory plus our currency’s never-ending devaluation through central bank managed inflation and other budget-busting price hikes.